Maidenhead responded immediately to Hayes & Yeading's Boxing Day victory by taking all three points this New Years Day at York Road courtesy of two second half Richard Pacquette goals. While "Drax" tinkered with his Magpies line-up, Garry Haylock stuck with side that saw off Maidenhead just six days previously and on early possession it looked to be a good decision as we should have been ahead by the 15 minute mark. Just 40 seconds had been played when a Steven Gregory cross from the right fell nicely to Gary MacDonald, his volley from just outside the area was palmed away by Shane Gore and as Tom Cadmore tried to force the ball home from close range his effort was blocked by Mark Nisbet. The 13th minute should have seen the opening goal Haylock's side, Calum Botham flicked the ball into the run of Josh Scott, he outpaced his marker before squaring the ball to James Mulley who saw his shot beat Gore, hit the inside of the post (pictured right) and fly across the face of goal and wide of the opposite post. Just a couple of minutes later Cadmore rose to head the ball towards Gore's goal but the faintest of touches from Omari Coleman at the far post could not put the effort into the net. Not really sure what then happened to change the game but the home side came into the equation as we seemed to go into retreat mode. Just before the half hour mark, Matt Ruby slipped which allowed Richard Pacquette to work the ball into Howe's area, he squared to Rocky Baptiste but he screwed his shot well wide of the target. Minutes later a weak back pass saw Howe in a race from goal against the on-coming Pacquette, the keeper just about won the race and the ball cannoned off the striker for a goal-kick. As the half drew towards its conclusion, it was still the Magpies pressing for the opener. 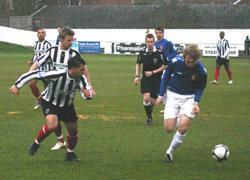 Pacquette broke down the right and picked out Dale Binns at the far post, his volley though was easily gathered by Howe. Pacquette and Baptiste then played a neat interchange that led to the former having a strike with the outside of his boot but it curled wide of the target. Seven minutes had elapsed in the second period and again Garry Haylock's side should have taken the lead. Scott burst through between two defenders, his shot was blocked by Gore and when the ball ran loose to Mulley all were hopeful until he blazed over the crossbar from 18 yards out. 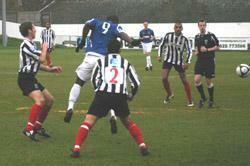 Just after the hour mark a "Drax" substitution proved perfect for the Magpies. 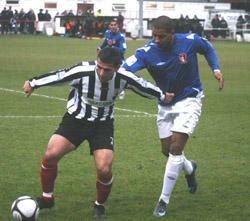 Former Hayes & Yeading skipper Nevin Saroya smashed the ball out of defence and found substitute Mustafa Tyriaki on the left flank and despite looking offside the flag was never raised and he set off towards Howe's goal, he fired across the keeper and when his shot came back off the post Pacquette was on hand to fire home. Exactly as Hayes & Yeading had done six days earlier, the second goal was just two minutes away when a defensive mix up between Howe and MacDonald presented the ball on a plate to Pacquette who gleefully accepted his new years present. Despite throwing Kieran Knight into the fray upon his return from injury, the home defence really were only tested once and that was when Coleman controlled a long Howe clearance and shot on the turn from 20 yards but Gore was never troubled as the ball went wide of the upright. In fact the Magpies were closest to finding the net in the final ten minutes when Ashley Nicholls played Pacquette through, Howe was quickly out to block his effort and when the ball fell to Tyriaki, Howe again threw himself in the way to block his shot to safety. Website United Man of the Match: Josh Scott.